The love of God has been poured into our hearts through the Holy Spirit that has been given to us. "He is," they answered. "He's ahead of you. Hurry now; he has just come to our town today, for the people have a sacrifice at the high place. As soon as you enter the town, you will find him before he goes up to the high place to eat. The people will not begin eating until he comes, because he must bless the sacrifice; afterward, those who are invited will eat. Go up now; you should find him about this time." Now the day before Saul came, the Lord had revealed this to Samuel: "About this time tomorrow I will send you a man from the land of Benjamin. Anoint him leader over my people Israel; he will deliver my people from the hand of the Philistines. I have looked upon my people, for their cry has reached me." "I am the seer," Samuel replied. "Go up ahead of me to the high place, for today you are to eat with me, and in the morning I will let you go and will tell you all that is in your heart. As for the donkeys you lost three days ago, do not worry about them; they have been found. And to whom is all the desire of Israel turned, if not to you and all your father's family?" Then Samuel brought Saul and his servant into the hall and seated them at the head of those who were invited — about thirty in number. Samuel said to the cook, "Bring the piece of meat I gave you, the one I told you to lay aside." So the cook took up the leg with what was on it and set it in front of Saul. Samuel said, "Here is what has been kept for you. Eat, because it was set aside for you for this occasion, from the time I said, 'I have invited guests.' " And Saul dined with Samuel that day. After they came down from the high place to the town, Samuel talked with Saul on the roof of his house. They rose about daybreak and Samuel called to Saul on the roof, "Get ready, and I will send you on your way." When Saul got ready, he and Samuel went outside together. As they were going down to the edge of the town, Samuel said to Saul, "Tell the servant to go on ahead of us" — and the servant did so — "but you stay here awhile, so that I may give you a message from God." Saul has gotten more than he bargained for! He went to the little town to buy advice from a seer with his last little bit of money; and suddenly, he finds himself the guest of honor at a feast, with the seer promising him a message from God. His remark about being a Benjamite reminds us how often great leaders seem to come from little backwaters of a country. 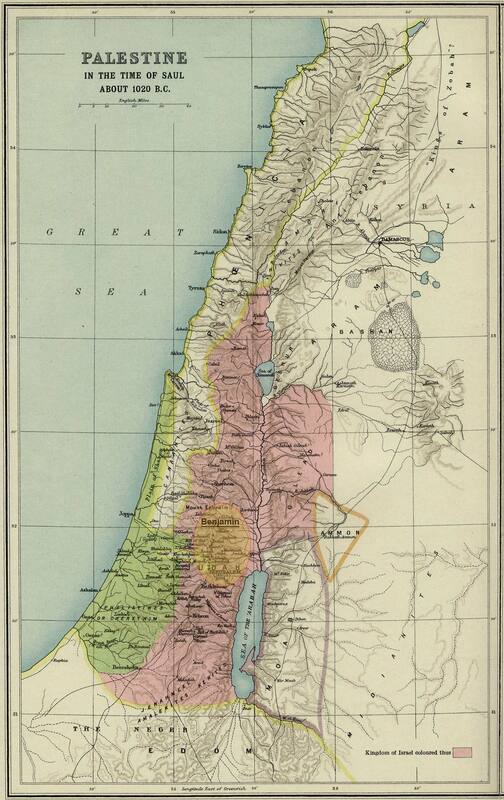 These events occurred just about 1000 B.C., and Benjamin is the smallest tribe of Israel. I have colored in the rough area occupied by the Benjamites at the time, seen on this map as a dull orange circle with a red border. The Philistines occupied the large green area to the west of Judea, showing why they were such a threat to the Hebrews.